The production of the Book of Mormon is by all accounts an impressive accomplishment by Joseph Smith, who was only 23 years old when he dictated it to his scribes. How he did this has been a contentious issue ever since its first publication. Three main explanations have been proposed: that Joseph received the text by divine revelation, that he plagiarized the text from an earlier publication, or that he composed the text himself using the King James Version (KJV) of the Bible and perhaps some other sources. The first two views generally assume that the production of the Book of Mormon text would have been utterly beyond Joseph’s capacity. Rather than prejudging that question, a sound method would be to examine the proposed sources in order to determine which explanation is most likely. Regardless of how the Book of Mormon as a whole is explained, it is really beyond reasonable doubt that a major source used in the Book of Mormon is the KJV. This includes both the many chapters duplicated whole or in large part and the many shorter statements in the Book of Mormon that parallel or allude to statements in the Bible. All non-Mormon critics of the Book of Mormon (and some Mormons) agree on its heavy use of the KJV. Of the 239 chapters in the Book of Mormon, 27 are duplicates of most or all of 27 chapters in the Bible. These include the Ten Commandments (from Exod. 20), 21 chapters from Isaiah (Isa. 2-14, 29, 48-54), Malachi 3-4, and Matthew 5-7. Eighteen of these duplicated chapters appear in the first two books of the Book of Mormon, mostly in 2 Nephi. There are several reasons to question the Book of Mormon’s claim that these chapters were all repeated by ancient Nephite prophets on the gold plates that Joseph said he merely translated. For one thing, two-thirds of the Bible chapters duplicated in the Book of Mormon happen to appear in the material Joseph produced to replace the lost 116 pages—accounting for over one-fourth of that replacement text. For another thing, the Book of Mormon itself makes statements in tension with the presence of so much material from the Bible. It states repeatedly that there was a shortage of space on the plates forcing the authors to economize on what they tried to include (e.g., Words of Mormon 1:5-6; Mormon 8:5; 9:33). Nephi, who does most of the quoting from Isaiah, had Isaiah and other Jewish scriptures preserved on “plates of brass” taken to the New World (e.g., 1 Ne. 5:10-19; 19:21-22; 2 Ne. 4:2, 15). So why use precious space on the gold plates copying, for example, all of Isaiah 2-14 without interruption (2 Nephi 12-24)? Nephi also states that the Bible was going to be altered by wicked religious people who would remove many “plain and precious” things from it (1 Nephi 13:24-40). Mormons, including Joseph Smith himself, have understood this to mean that the text of the Bible was severely corrupted in many places, whether by material being copied incorrectly, deliberately removed, mistranslated, or some combination of these actions. Oddly, though, the material from Isaiah in the Book of Mormon is remarkably similar to the text of Isaiah in the KJV. For example, the 654 words in the original edition of 2 Nephi 21-22 are verbatim identical to Isaiah 11-12 KJV. The Book of Mormon retains most of the mistranslations in the KJV passages it quotes, such as “Lucifer” (Isa. 14:12 KJV; 2 Nephi 24:12). There is only one long, significant addition to any of the biblical chapters in the Book of Mormon: over 700 words are awkwardly added to Isaiah 29 in 2 Nephi 27 to make it a prophecy about Joseph Smith and the Book of Mormon. Ironically, one of the main objections to the argument for the Book of Mormon’s dependence on View of the Hebrews is that many of its ideas (especially about American Indians being the descendants of Israelites) were circulating widely in Joseph Smith’s day. Such an objection may weaken the case for direct dependence on Ethan Smith’s book but strengthens the case for an early nineteenth-century origin of the Book of Mormon. LDS scholars have also pointed out numerous ways in which the two books differ from one another—but such an objection is logically invalid, since the claim is not that the two books are identical but that one is significantly indebted to the other or at least reflects the same milieu. The dominant theory among non-Mormons since Fawn Brodie’s 1945 biography of Joseph Smith has been that he was the true author of the Book of Mormon, perhaps with the help of Oliver Cowdery. 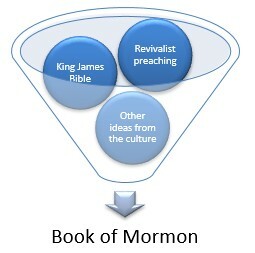 According to this approach, the Book of Mormon was essentially a new text created by Joseph Smith, alone or with help from Cowdery. Several considerations suggest that Joseph was the primary author: his reported abilities as a storyteller, his evident familiarity with the KJV even as a youth (as he himself claimed in his 1832 autobiographical account), his reported lack of notes or other materials used in the dictation process (at least when it was observed by others), and the consistency of Book of Mormon doctrine with Joseph’s earliest doctrinal views. Against this view, other non-Mormons as well as Mormons have objected that Joseph did not have the ability to produce such a complex text especially in so short a time. The force of this objection is at least somewhat blunted by the use of the KJV and other sources and by the possibility of an active role for Cowdery in the production of the text. The nature of the evidence makes it unlikely that any one source can be verified beyond reasonable doubt or can be shown to cover all of the evidence. Some of the many factors to be considered include Joseph’s secretiveness about the gold plates, his refusal to provide specific information about the translation method, the complexity of the Book of Mormon, its demonstrable dependence of the KJV, the many gaps in our knowledge about Joseph’s movements and activities during the 1820s, and the matter of the lost 116 pages. The best explanation is probably a complex one. Joseph Smith evidently made use of several sources, either directly and purposefully (as in his use of the KJV) or indirectly (as in his drawing on ideas attested in various books of the era, even if he never personally read them). He also likely had some help, with Oliver Cowdery being the most likely source of such assistance. The “faithful” LDS explanation, that Joseph translated the whole of the Book of Mormon by the gift and power of God, may be disarmingly simple but it has its own set of evidential challenges. 1. The most sophisticated defense of the Spalding theory is a book by three members of the Spalding Research Associates: Wayne L. Cowdrey, Howard A. Davis, and Arthur Vanick. Who Really Wrote the Book of Mormon? The Spalding Enigma (Saint Louis: Concordia Publishing House, 2005). 2. The most thorough attempt to show the Book of Mormon’s indebtedness to View of the Hebrews to date is David Persuitte, Joseph Smith and the Origins of the Book of Mormon, 2nd ed. (Jefferson, NC: McFarland, 2000). 3. B. H. Roberts, Studies of the Book of Mormon, 2nd ed. with a new Afterword, edited and with an introduction by Brigham D. Madsen (Salt Lake City: Signature Books, 1992).